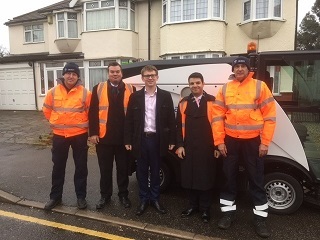 Leader, Deputy Leader and Cabinet Member for Environment with Havering street cleaning staff. The plans, which were the focus of a Cabinet meeting last night Wednesday (13 February 2019), will also see nearly £150 million pumped into building more genuinely affordable housing and other neighbourhood improvements. This comes on top of a separate £10 million that has been earmarked to improve housing estates. The rise is lower than the maximum 4.99 per cent allowed by Government which many councils in the UK are expected to adopt. It will mean that Havering’s share of council tax for the average Band D property will increase by less than £1 a week from £1363.83 to £1408.15. From the housing budget there is also a plan to spend £10million improving housing estates. Councillor Damian White, the Leader of Havering Council said: “This is a budget that responds to and acts on the issues that matter to our community the most. It is a budget that will see major improvements in roads, pavements and street cleaning while continuing to invest in services for people who are more vulnerable. If approved by Full Council on February 27, the budget will see £13.2 million saved in 2019/20 rising to a total of £40.4 million by 2022/23 in order to balance the budget. The council is becoming more efficient in the way that it delivers services to reduce costs and keep council tax increases to the minimum.